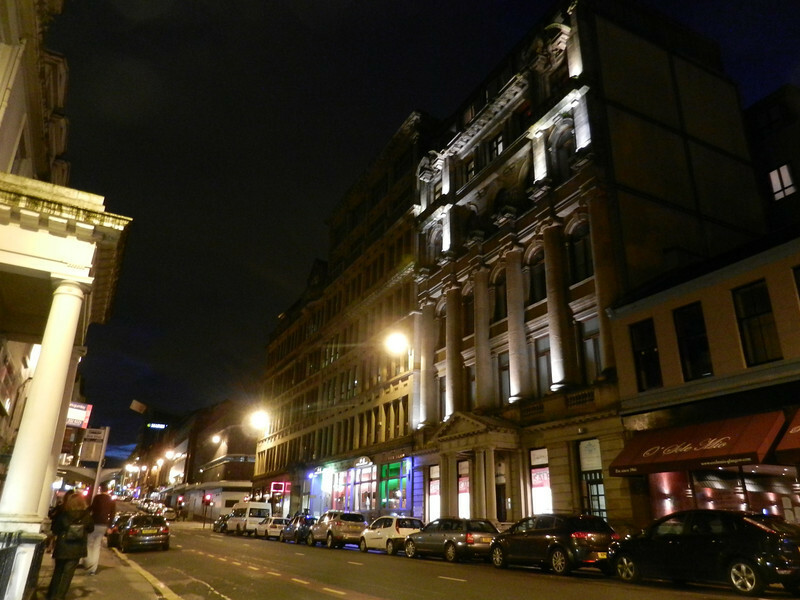 Of the two large cities in Scotland, Glasgow is the more modern and 'real' city. Edinburgh, by contrast, is a bit more touristy, with a castle and stuff like that. "You won't hear bagpipes and see people walking around in kilts, that's more Edinburgh stuff," said S. at some point during our journey to her hometown. 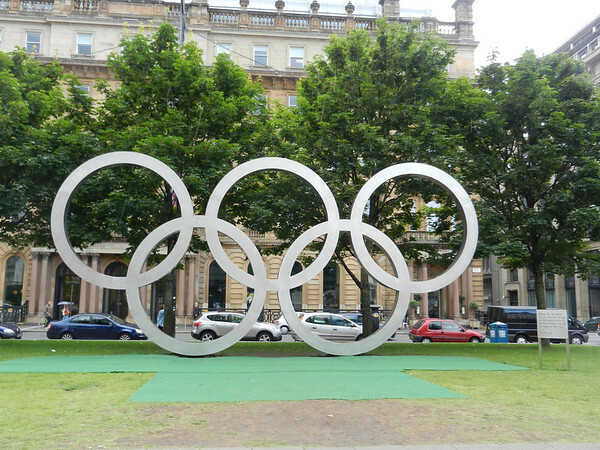 Glasgow played host to a group that, for the women's soccer tournament, included the US, France, Colombia, and North Korea. The city didn't really have much in the way of Olympic spirit going for it, other than one of the bizarre mascots in the train station (please note the kilt), a set of Olympic rings in the main square (above) complete with warning sign, and a lonely volunteer handing out literature on the main shopping drag; no beer tents or fan areas (as per the Women's World Cup in Germany last year). The most important thing to do, after finding our living quarters (there was a kilt store just across the street), was to get some curry. We went to Charcoals, an Indian place about three blocks away, and nearly were in tears over the food, not because it was overly hot, but just because it was so flavorful. Swedish food is tasty but bland. 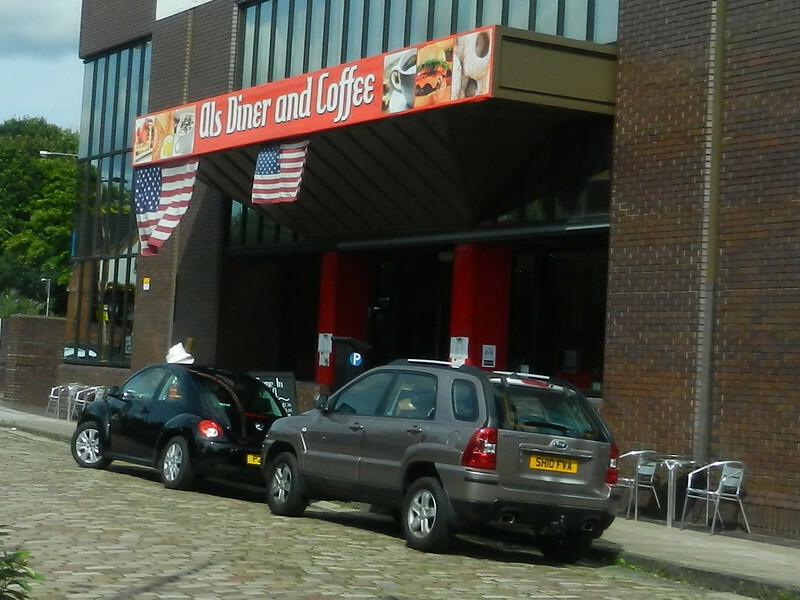 I think many immigrants decide to open restaurants here, seeking the flavors of home and seeing the complete lack of them, but as a whole, Swedes just don't seem to be into strongly flavored food, and some little while after opening, all restaurants take the spiciness down. For some reason, instead of mints, this restaurant brought us jello shots with the bill. Next day, two soccer games: US versus France followed by Colombia versus North Korea (with synchronized ball boys as an unadvertised bonus, right). A free shuttle bus took us from the train station to the venue (on the way, US support was spotted, as were Questionable Establishments ("Is it seedy here?" I asked. (long pause) "Well, I wouldn't go to an unknown bar in this neighborhood," said S., as we peered out the bus windows). At the drop-off point, a volunteer in a pink-and-purple polo shirt (and red plaid kilt that did not match) led us to the park. 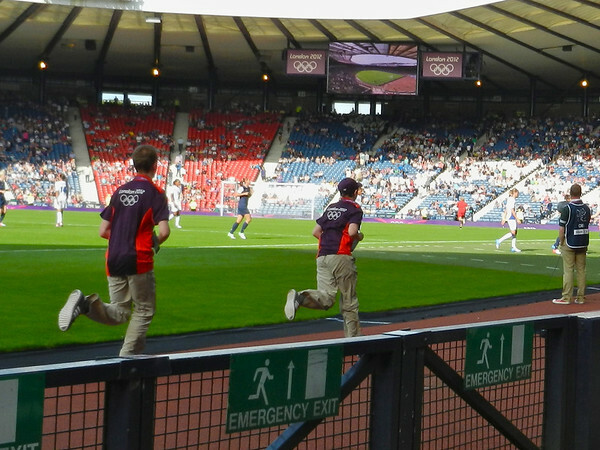 The venue, Hampden Park, is home of the Scottish national team. As we arrived, a bagpipe could be heard bellowing across the parking lot from the upper balcony. The evening was sunny and warm enough that short sleeves were enough, and the first game a fun one to watch, as France gave eventual gold-medalists US a real scare by jumping out to a 0-2 lead within the first 15 minutes (the US eventually won 4-2). 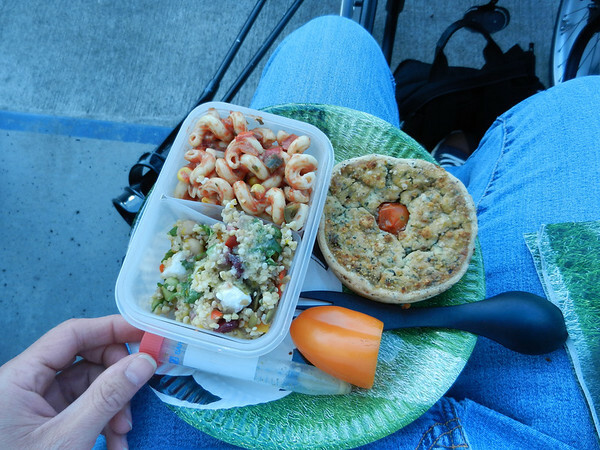 In between the games, we ate our picnic lunch and were entertained by a ~20-piece fife-and-bagpipe-and-drum core. Who were all wearing kilts, of course. A pack of young men appeared from entrance near us. I nudged S. with my elbow. "Look, Swedes," I whispered, going by their clothes and haircuts. S. looked at them surreptitiously, just as one of them started talking in a language that sounded familiar... but wasn't quite right... "Close," she muttered at me, and we nodded in agreement: Danes. They sat behind us, laughing and joking with each other and showing signs of being, let us say, in fine spirits. 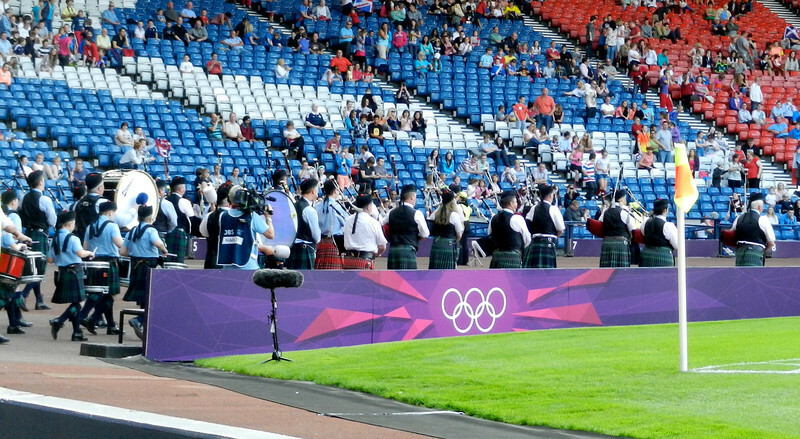 The crowd had diminished perceptibly after the first game, revealing the white-on-blue saltire of Scotland in the end-zone seats (see picture below). Suddenly the stadium erupted with whistling. Why? What was going on? 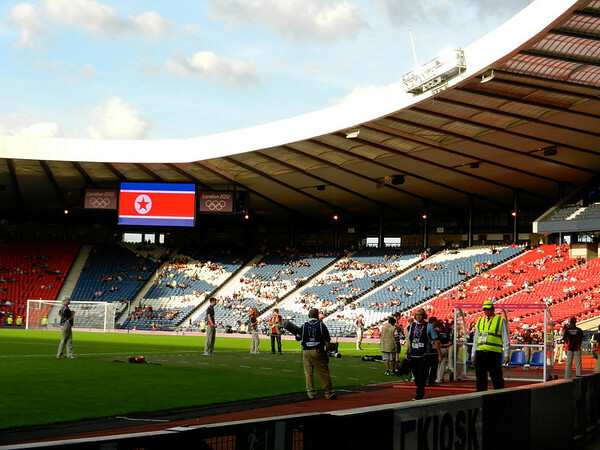 Why was there a North Korean flag displayed on the jumbotron, hovering menacingly over the saltire? "It looks like North Korea is taking over Scotland," S. chuckled. Wait, what time was it, anyway? A quick check of our timepieces showed that the kick-off should have happened five minutes earlier. In fact the stadium had introduced the players; in retrospect we are slightly ashamed to admit that neither of us had noticed what had happened. The whistles continued; a wave started and made it seven times around the stadium, which is pretty impressive given how few people were there. Eventually a voice came over the PA system, apologizing for the delay and saying that it was a result of "... An issue behind the scenes." (Well, yes, thank you, we had kinda figured that out already.) The field had been cleared for the game, but now a couple of coaches from Colombia came back on to the field and put out practice cones. The whistles from the stadium turned to boos. The Colombian team came back to warm up. The next day, officials at the stadium blamed the pre-made media package that they received from London. 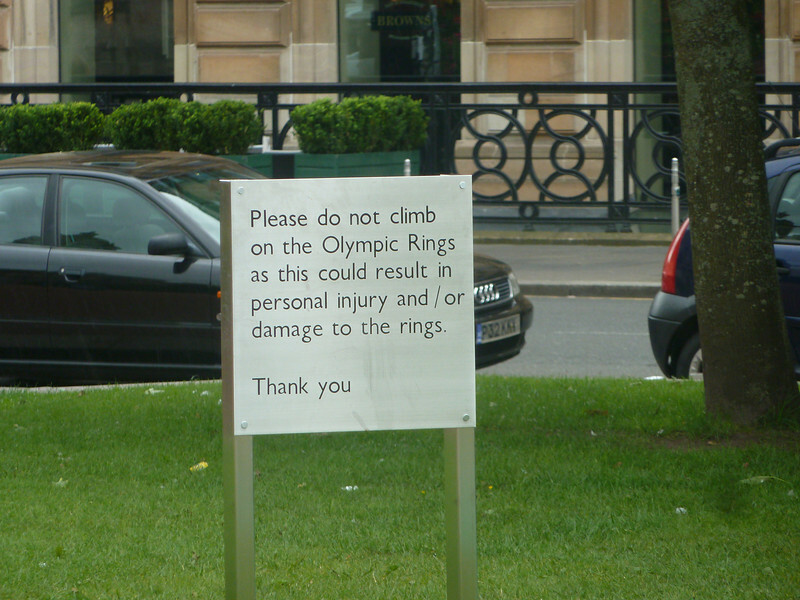 I'm not sure when Glasgow started trusting things sent from London, but I'm sure they won't make that mistake again! It's still unclear why the flag showed on the jumbotron for nearly an hour. Perhaps the stadium officials were trying to say "See, we do know what your flag looks like"? 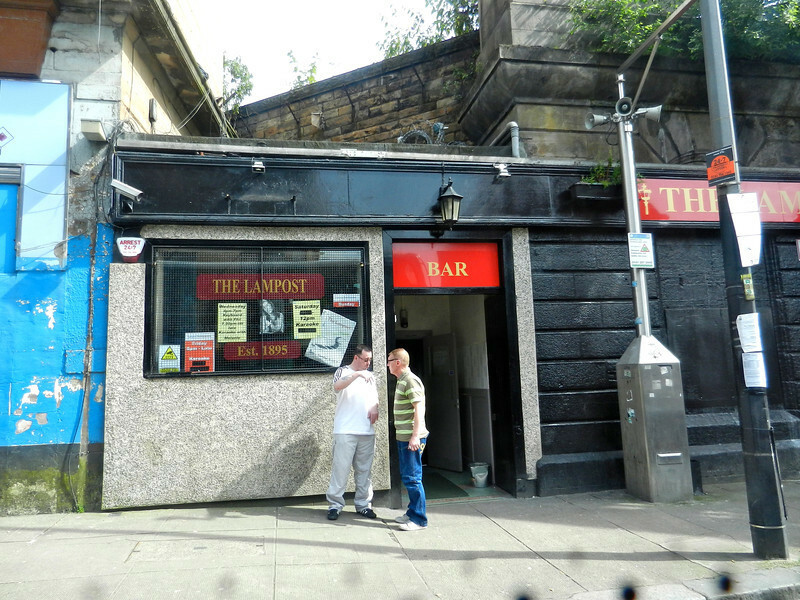 Coming soon in Scotland Part Two: A pub, a park, and a passel of friends and relations; two more games and I get the ball again, but this time for real.